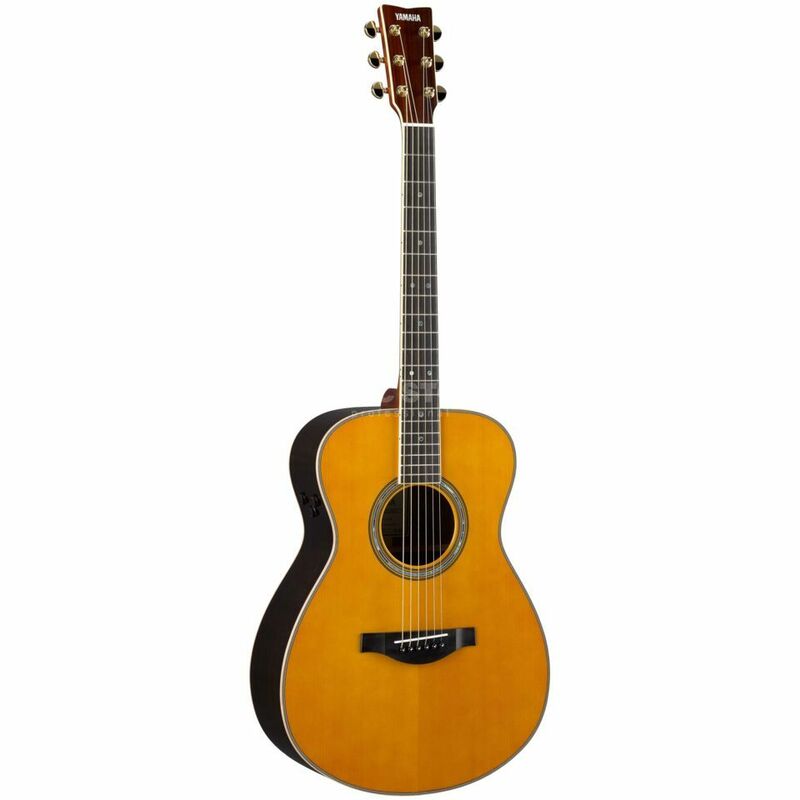 With the Yamaha LS-TA Western guitar series, Yamaha combines the proven sound of the Yamaha Original Jumbo Western design with the groundbreaking TransAcoustic technology. This allows classic chorus and reverb sounds without the use of external effect devices or amplifiers in breathtaking and room-filling quality. But also for amplified sessions the extensive acoustic guitar is equipped with a System70 pickup system with integrated piezo pickup and preamplifier. The LS-TA of the TransAcoustic series has slightly more compact body dimensions than the LL-TA. The Yamaha Jumbo is one of the most popular designs in the western segment and presents wide and voluminous sounds thanks to outstanding wood selection. A solid tonewood top made of Engelmann spruce with A.R.E. treatment (Acoustic Resonance Enhancement) ensures the striking treble spectrum of well-practiced spruce, while a resonance body made of solid rosewood also ensures powerful bass and an interesting midrange spectrum. Last but not least, the long scale length of 650mm provides a tight response in all positions. The TransAcoustic Actuator on the inside of the body creates chorus and reverb effects through its individual vibration. With probably the biggest innovation in electroacoustic guitar in recent years, Yamaha has caused a stir. Yamaha's TransAcoustic technology was originally developed for sound transmission to the soundboard of digital pianos and finally transferred to the acoustic guitar by the Yamaha R&D team. With the help of an actuator, which vibrates on the inside of the body in relation to the string vibration, purely acoustic modulation and reverb effects in the form of a chorus and reverb effect can be generated. An amplifier to reproduce the signal is therefore no longer necessary. With just three simple controls in the LS-TA's frame, you can control the pickup system and TransAcoustic effects. The integrated System70 TransAcoustic pickup system is available for those who still want to play the guitar with electric amplification. A classic piezo pickup under the bridge insert picks up the string vibration and transmits it to the integrated preamplifier of the pickup system. The TransAcoustic reverb effect (1), chorus (2) and the pickup's line signal can also be controlled from the pickup's control panel and the TA effects function can be switched on or off (3). TransAcoustic technology with purely acoustic chorus and reverb effect - no external effect devices or amplifiers required!